UPDATED: Tue., Jan. 2, 2018, 8:45 p.m. When Karin Wagemann returns to Tanzania this month, the master canine trainer will find out if her pupils developed any bad habits. It’s not her four-legged friends she’s worried about, though. 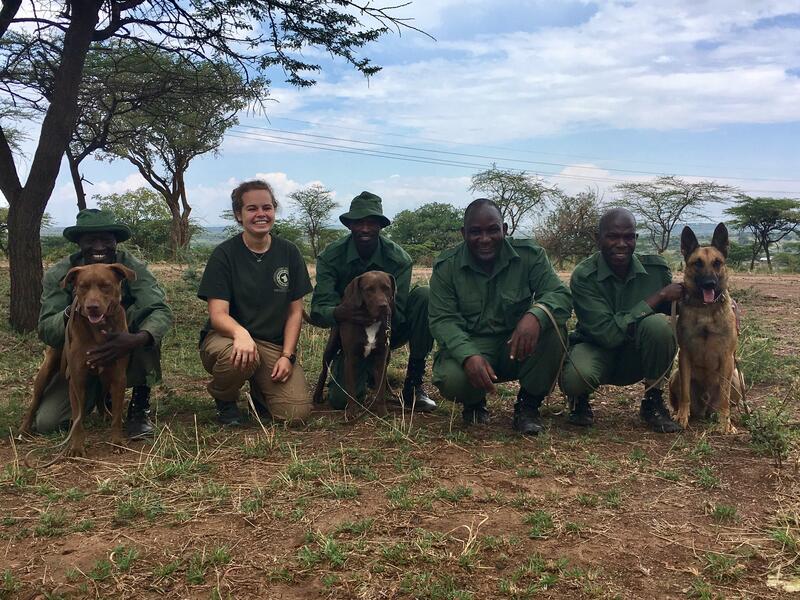 Wagemann, an American Society of Canine Trainers instructor, will continue her coaching of six Tanzanian handlers in charge of the dogs in their fight against the country’s poaching epidemic. The four dogs are chocolate labs Tony and Popo, and DJ and Radar, who are Belgian Malinois. They were trained in America to detect ivory, rhino horn, pangolin scales, ammunition and hippo teeth. They arrived on the border of the Serengeti in September with Wagemann, who returned to the U.S. in November. Each of the six handlers is a game scout from the Grumeti Law Enforcement Division, all selected by Wagemann. For two months she taught the men basic canine management, advanced detection and tracking. They’ve been working on their own with the dogs the past eight weeks. The language barrier was challenging for Wagemann, a 2012 University High School grad, but the men’s love and dedication for the dogs has made her job substantially easier, she said. Rampant ivory poaching has taken its toll on Tanzania’s elephant population, which has dwindled more than 60 percent in recent years, according to reports. Stifling the illegal activity is a dangerous pursuit for the dogs and handlers, Wagemann said, but her group has yet to deploy live. Once they do, she said, the dogs will be placed at roadblocks. And what happens when the dogs track the smuggled items on a poacher? “The dogs sniff you out and think you have a toy for them. They’re not aggressive,” said Wagemann, who said her program exclusively uses rescue dogs from shelters. Growing up in Spokane, Wagemann said she gravitated more toward dogs than her peers, which led to her major of Anthrozoology at Carroll College in Helena, Montana. After graduating in 2015, she said a professor, a police dog trainer, helped give her valuable experience working with police and protection dogs. After earning her masters degree at London Hanover University, she began her police dog training internship in Virginia, ultimately leading to her gig in Africa. Published: Jan. 2, 2018, 6 a.m. Updated: Jan. 2, 2018, 8:45 p.m.